We want our authors’ research to get the visibility and recognition it deserves. Chemical Science is dedicated to publishing findings of exceptional significance from across the chemical sciences. The graph below shows the number of citations to articles published in 2013 in Chemical Science and other leading general chemistry journals. 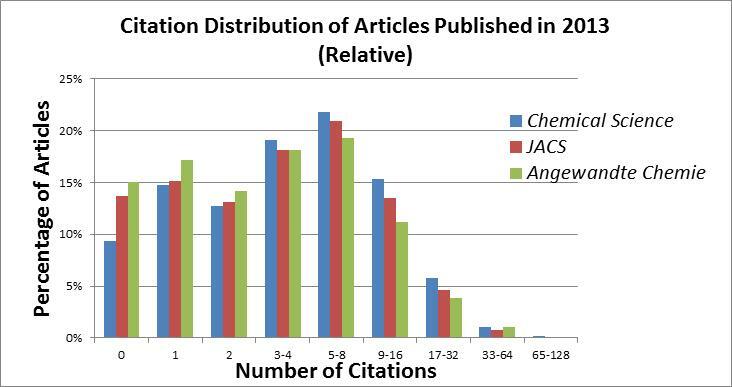 It’s clear to see from this data that articles in Chemical Science are less likely to receive no citations and after just a few months of publication articles will be highly cited – 45% of 2013 Chemical Science articles have already received 5 or more citations. Publishing your research in Chemical Science means your article will have excellent visibility and will be read and cited quickly by your colleagues. Wow…… this was so in-depth!! Thanks a lot for providing this awesome information and graph for free.